Snark is a wholly underrated tool for dealing with trademark bullies. While we've seen it employed in the past, the victim of trademark bullying turning the tables on the bully with humor is something that still is far too rare. One brewery recently showed exactly how this is done. Voodoo Brewery has been selling its H2P IPA since 2014, with a can label that nods towards the University of Pittsburgh, where the brother of the brewery's founder went to school. It was only in late 2017 that the school sent out a cease and desist letter, claiming trademark infringement. Voodoo started selling H2P in its original can in 2014. The beer grew in popularity and was twice featured on Pitt’s campus after its release. Then, in October, Pitt called Voodoo and asked it to cease and desist distributing the “H2P” IPAs with the school’s trademarked image, font and phrase. Voodoo released the newly designed cans a few weeks ago and they sold out in a couple of days. Voodoo’s chief executive office, Matteo Rachocki, said that he and others at Voodoo were surprised at Pitt’s cease and desist request, since the beer was on the market for three years prior. “We had been invited on campus to pour the beer twice, so we had just kind of assumed that we had their blessing,” Rachocki said. That obviously wouldn't hold up as any kind of a legal argument, although one wonders what exactly explains the delay in Pitt's enforcement. The beer was not only known to the school, but had been displayed on campus, I assume specifically because of the tie in with the school. That sounds like it should have been an awesome example of a school understanding that the education and alcohol sectors are not common marketplaces, and working to support an alumnus. That possibility is now gone, with the school taking the strong arm route. Well, it doesn't appear that Voodoo will be deprived of the last laugh, even as it complies with Pitt's C&D. Rachocki met with Pitt officials Jan. 22 to work out a deal that would allow Voodoo to use Pitt trademarks. Rachocki said the new design for the can labels was on the conference room table when Pitt officials came to meet at the brewery. He said he presented the cans to make University officials aware of the brewery’s plan for the IPA if they couldn’t secure rights to Pitt’s trademarks. After an initially encouraging meeting in January, Rachocki said Pitt stopped responding to his emails. The new cans still feature Pitt’s trademark blue and gold color scheme, but that’s where any allusions to Pitt end. The cans now read “NON-TRADEMARK INFRINGEMENT ALMA MATER IPA” with no other Pitt-related images. The name refers both to the bullying Pitt did, as well as the fact that alumni work at Voodoo Brewery. Frankly, that's not a good look for Pitt in the public, but it's a wonderful example of how far a little snark can go in responding to trademark bullying. You'll recall that we recently commented on the NFL's new dumb social media policy for its member teams, which outlines how much video content a team can push out as kickoff approaches (less than before), what type of video content from games teams can produce and distribute on their own (basically none), and the size of the fines if teams violate this policy (huuuuuge). The NFL has insisted elsewhere that this one-size-fits-all marketing approach has zilch to do with its precipitous ratings decline, although few believe it on this point. And, even as news of the policy has been released, the NFL itself has been inclined to push out as much of this very same content itself, centralizing its social media media control. So, if you're an NFL team that doesn't like the new policy and wants to make its fans aware of how silly it is in the most hilarious way possible, what do you do? Well, if you're the Cleveland Browns and the Philadelphia Eagles, you push out Twitter updates to your followers that depict game highlights using plastic figurines. Here is how the Browns alerted their fans that their team had scored a touchdown. And here is how the Eagles notified their Twitter followers of an in-game interception. One wonders exactly how quickly the NFL's policy will be updated to include fines for snarkily shitting on that same policy. I imagine it will come quickly, because the NFL has not shown a propensity for having a sense of humor. Meanwhile, this should highlight exactly why the policy is so silly. Here we have creative, snarky, funny social media folks at these NFL teams whose talents are being wasted due to a top-down marketing approach from a league office that is overseeing the first ratings decline for the NFL in decades. Sure, Verizon may be endlessly misleading when it comes to everything from the spectrum crunch to network investment. And when it comes to anti-competitive telecom behavior it wrote the book. Hell, Verizon's even in many ways directly responsible for this week's net neutrality ruling by suing to overturn the original flimsy net neutrality rules -- rules every other ISP had absolutely no problem with. But while you can say a lot of things about Verizon, you can't say the company doesn't have a sense of humor. As you might expect, Verizon took to the company's blog to protest the FCC's new TItle II based net neutrality rules. 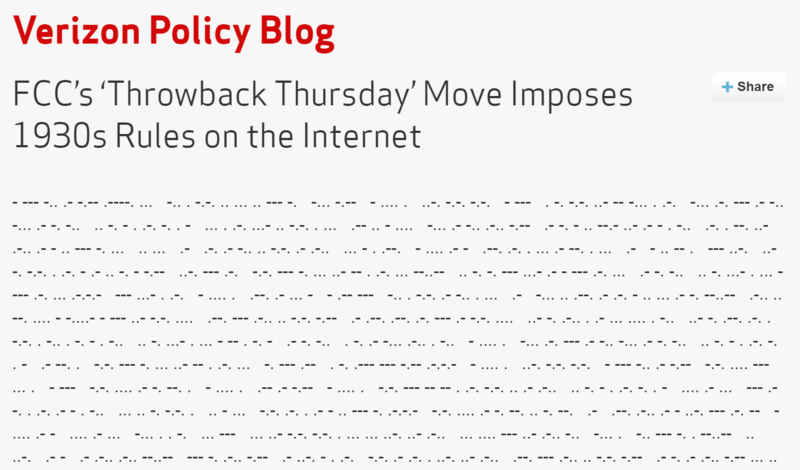 Amusingly however, it posted the entire thing in Morse code -- piggybacking on the oft-repeated ISP mantra that applying older Title II regulations to broadband is a dangerous and historically backwards proposition (because all old laws are automatically bad laws, get it?). "Today’s decision by the FCC to encumber broadband Internet services with badly antiquated regulations is a radical step that presages a time of uncertainty for consumers, innovators and investors." Of course if we were to stop using laws just because they smell like mothballs, we'd be in for quite an adventure. After all, the Constitution is pretty old, right? As is the Communications Act of 1934 and the revamped Telecommunications Act of 1996, which govern spectrum allocation and without which Verizon couldn't function as a company. Stupid old laws. So unnecessary! It's an overly-simplistic argument, made more so by the fact that Verizon's FiOS network -- and the voice component of their wireless network -- are governed by Title II in some instances to glean Verizon some lovely tax breaks. "What has been and will remain constant before, during and after the existence of any regulations is Verizon’s commitment to an open Internet that provides consumers with competitive broadband choices and Internet access when, where, and how they want." Yes, so committed is Verizon to an open Internet, it has violated the principles of Internet and device neutrality more aggressively than perhaps any other company, whether that's trying to block GPS radio functionality unless you use their navigation software, or charging completely illogical fees to use basic functionality embedded in phones (like tethering, or Bluetooth). Verizon's also fairly insistent on ignoring the fact it was their lawsuit that pushed the FCC toward Title II in the first place, so if there's "regulatory uncertainty" at play, the lion's share of the blame belongs on Verizon's shoulders. Still, you've got to hand it to Verizon for at least showing a sense of humor about the whole thing. That's more than Comcast or AT&T were capable of.